This article includes photographs & dimensions of asbestos-containing floor tiles that were either asphalt-asbestos or vinyl-asbestos-based. This article series explains how to identify floor tiles that are likely to contain asbestos, by making a simple visual inspection, noting the probable age of the building and age of its materials, and similar clues. 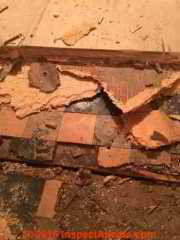 Here we provide photographs and descriptive text of the sizes in which asbestos-containing floor tiles were sold. Below we include a description of very small presumed-asphalt-asbestos floor tiles in a 1 1/2" size bonded to a jute backing fabric, as we illustrate just below, courtesy of an anonymous reader. Shown below is a vinyl-asbestos floor specification summary and usage guide from a 1959 Armstrong floor tile catalog. The table shows the recommended usages of these floor tiles at different thicknesses, or gauges or weights. Question: what is the weight of a typical asphalt-asbestos floor tile? I need to know the specifications of the old , commercial ( so 1/4 - 1/8 ) , 9x9 asphalt tile. I mainly need to know weight of the tile. I have scoured the internet and cant seem to locate this. I am willing to pay by credit card to expediate the help. Asphalt-based or asphalt-asbestos floor tile in the 1/4" thickness range weighs about 1 pound per square foot. Asphalt floor tile that is 1/8" thick will weigh about 1/2 pound per square foot. 1 sq.ft. = 12 x12 = 144 sq.in. A 9"x9" floor tile = 9 x 9 = 81 sq.in. The size of a 9x9" tile in sq.ft. is 81 / 144 = 0.56 sq.ft. The weight of a 9x9" 1/4" thick asphalt asbestos floor tile will weigh about 0.56 lbs. The weight of a 9x9" 1/8" thick asphalt asbestos floor tile will weigh about half that or 0.28 lbs. Vinyl asbestos floor tiles of the same dimeinsions will be a bit lighter. Watch out: asphalt asbestos floor tiles can often contain as much as 70% asbestos by weight. Asbestos was used as both a filler (using asbestos waste materials) and in fibrous form as a reinforcer. All of these sources agree on the general weight of asphalt asbestos floor tile as I've used it above. None of them cites an original source. Question: do these 1.5" square floor tiles contain asbestos? 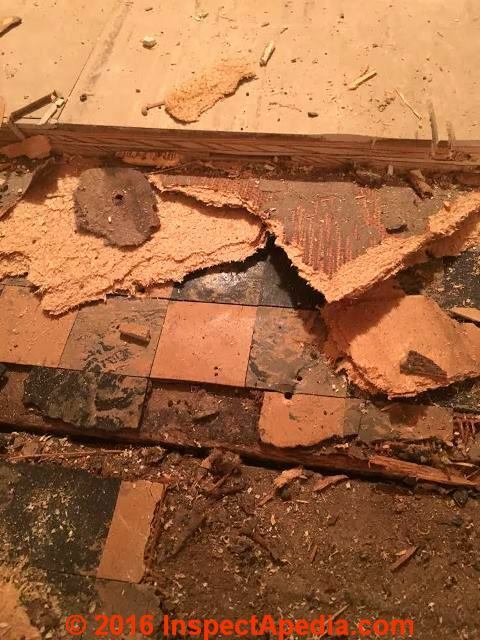 In my home built in the late 1930's I recently uncovered an older floor tile under several layers of plywood. Most of what I've found regarding asbestos tiles are that they're typically 9x9, 12x12 or sheet flooring. These tiles are 1.5"x1.5" and appear to be bonded together with woven fiber backing and some sort of black mastic (photos attached). One can narrow the question by a reasonable guess about the age of the flooring - in your case probably the 1930's. We can narrow the guess further if we know when a building was renovated, or by observing the type of tile adhesive or mastic used. The use of a fabric backer (shown in our third 1.5" tile floor photo) to lay small-tile flooring is an old and well-established practice that's still used today with some ceramic and wood floor tile systems. It was a significant labor saver as the multiple small pieces were provided by the manufacturer already bonded to a backer fabric. It's similar to laying sheet flooring and much faster than having to place such individual pieces. I suspect your flooring is asphalt-asbestos material rather than the later vinyl-asbestos product. It's not soft/friable and it's usually easy enough to control dust and debris. More on that in a moment. Tile dimensions and thickness are also useful. If you send me flooring I'll measure thickness. I would be grateful if you'd send me a sampler of these little tiles of each color for our own examination and documentation. Simply drop a few representative colors, along with some of the backing, into a freezer-type ZipLok bag, double-bagged, perhaps wrapped with cardboard to avoid damage. Further measurements & obseravtions about these tiny asphalt-asbestos floor tiles will be reported here. Readers whose buildings have this flooring type installed or who have experience with it or who wish to send their own 1.5" floor tile photographs are welcome to CONTACT us or to post remarks using the page bottom COMMENTS BOX to share further information. - Ed. I have 4 different colored tiles (The bathroom/kitchen/hall have a main color and an edge color). They don't look exactly like any of the tiles or colors, but the pattern is similar to 1955 - Armstrong Excelon Vinyl Plastic Asbestos Floor Tiles, Patterns & Color Guide Navajo Gray 781. Some six-inch asphalt based or floor tiles tested by a reader were reported to be asbestos free even though their pattern matched other 9"x9" asbestos-containing floor tiles in the Armstrong line. That's right 6" x 6" - though that floor tile size was rare. Asphalt-based asbestos floor tiles and plastic or vinyl-based asbestos flooring were popular in the U.S. in the 1940's - 1970's and were produced by some manufacturers (Armstrong) as late as 1980. Some asbestos-containing flooring products were manufactured (we estimate) as early as the late 1920's. Photo above from a 1950's home shows 9" square Armstrong Excelon-type VAT, courtesy of reader Kim who adds that asbestos testing indicated that the white floor tiles contained 7% and the black contained 5% asbestos. We suspect the actual asbestos levels are higher in these tiles because both fibers and fine asbestos filler particles were often used. Armstrong vinyl asbestos 9" x 9" floor tiles may also have been produced in three thicknesses, depending on the cost and durability desired by the consumer: 1/16", 3/32", and 1/8" thickness. 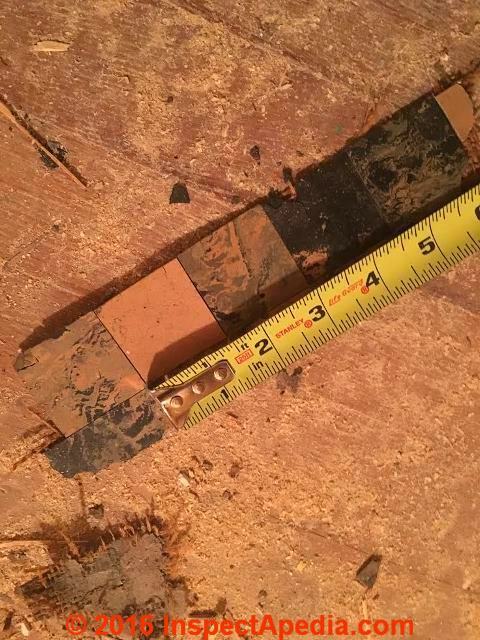 Our 9" x9" lab sample of Armstrong vinyl asbestos floor tile was measured at 3/32" (about 2mm) thick. Above: 9" asbestos-containing floor tile sold by Montgomery Wards®. At above left we show a 9" x 9" cork patterned vinyl asbestos floor tile found in a 1960's ranch style home in New York. At above right we show a 9" x 9" reddish brown asphalt or vinyl asbestos floor tile found in the same home. Shown here is a white with black inclusions 12" x 12" vinyl asbestos floor tile found in a 1960's U.S. home where 9" x 9" flooring was also installed in other rooms. Details about and more identifying photographs of Montgomery Ward vinyl asbestos tile flooring are at MONTGOMERY WARD ASBESTOS FLOOR TILE IDENTIFICATION. We discuss the history of vinyl-asbestos floor tiles in our Age of House articles at FLOORING MATERIALS. We discuss the inspection and diagnosis of various flooring defects, including vinyl asbestos tiles, at FLOOR TYPES & DEFECTS. Continue reading at ASBESTOS FLOORING IDENTIFICATION - home, or select a topic from closely-related articles below, or see our complete INDEX to RELATED ARTICLES below. 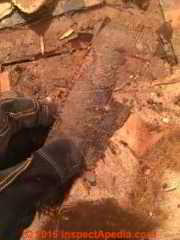 Or see DOES THIS FLOOR CONTAIN ASBESTOS? 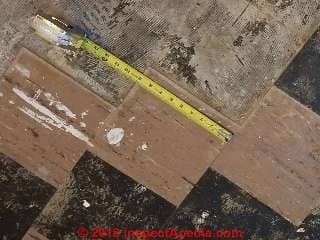 ASBESTOS FLOOR TILE DIMENSIONS at InspectApedia.com - online encyclopedia of building & environmental inspection, testing, diagnosis, repair, & problem prevention advice.